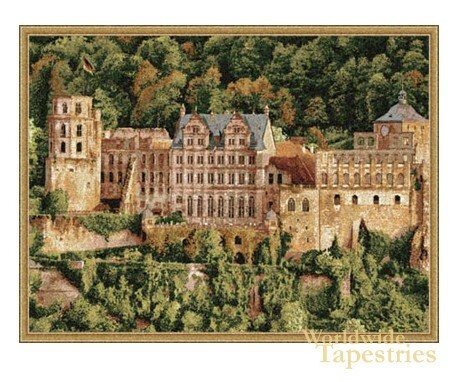 Reflecting one of the most romantic and scenic locations in Europe, this tapestry shows the Heidelberg castle nestled in the woods in Baden Wurttemberg in Southern Germany. Made of red sandstone, this famous castle is situated high above the Neckar River and the city of Heidelberg itself. The upper part of this castle was destroyed by a lightning bolt in 1537, and was rebuilt before it was damaged by the Thirty Years War in 1689, and then by the French and 1693, before another lightning strike in 1764. This castle was built in the early 15th century for the Palatine princes and the Freidrich V the 'Winter King' and was much admired by the famous poet Victor Hugo. Today, this castle boasts a huge attendance every year by tourists with hourly tours through its grand rooms, and it takes many steps along the path to get by foot to the entrance of this castle. This tapestry portrays the rustic castle amidst its natural surrounds of trees in complementary shades of greens and browns. This tapestry is backed with lining and tunnel for easy hanging. Dimensions: W 40" x H 29"